During an event attended by thousands on Bolivar Avenue in the city of Caracas, on the occasion of the 81st anniversary of the Bolivarian National Guard, two drones exploded close to the Presidential stand, as the country’s head of state was finishing his speech to the crowd. According to police accounts, the nature of the explosive material the drones carried was confirmed when they crashed. “Unofficial” sources told an opposition journalist named Román Camacho that the artifacts contained C4 plastic explosives. Minutes after the explosions, a group calling itself Soldados de Franelas (T-shirt Soldiers) took credit for the attack. They have been linked to the now-defunct paramilitary CICPC (Scientific, Penal and Criminology Research Corps) led by Óscar Pérez, which at the end of last year carried out several armed attacks on civilian and military institutions in the country, publicly taking credit on social media. This acknowledgement on their part invalidated the narrative disseminated about a “self-attack” or an “isolated explosion” in a building adjacent to Bolívar Avenue, which some operatives on social media, and international news outlets like the Associated Press, have attempted to present, to distract attention from the perpetuators and shield those responsible. The cell led by Pérez was dismantled by the country’s security forces earlier this year, but its remnants have returned to the stage, indicating that some are still willing to play the paramilitary card in Venezuela. 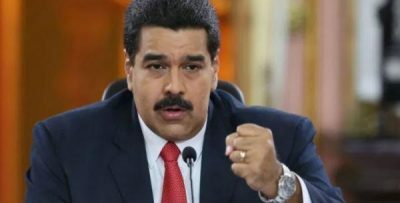 Initial investigations, according to Maduro, revealed the involvement of the Bogotá-Miami connection, of exiting Colombian President Juan Manuel Santos, and Florida-based agents. The assassination attempt also featured its share of symbolic violence, directed specifically toward entities responsible for the nation’s stability and the state in general. The nature of the event, and those present on the Presidential stand, reflect a purposeful selection of the moment for such an operation. Being celebrated was the anniversary of the Bolivarian National Guard, the military corps charged with maintaining internal order. Attacking the President precisely during this event, and not some other, bore a special symbolic element meant to show that the corps was vulnerable and incapable of a response in such situations. But the attack failed, along with what was supposed to happen subsequently, if the President’s life had been affected. The scenario planned was to foment chaos, take advantage of the opportunity to generalize internationally the rhetoric of an uprising, and create a critical mass for external powers to fill the “vacuum” of authority, to “stabilize” the country, and impose a new President from among those waiting in the wings to govern. The fact that the event was being broadcast live on national TV and radio reflects the intentional logic to imprint the spectacle, in the population’s collective imagination, as a turning point in the country’s contemporary history. They wanted not only to kill Maduro, but to make his death an unforgettable media event, nationally broadcast. In politics, sometimes body language says more than any speech. And in this sense, President Maduro will go down in history precisely for his conduct during a defining moment. At the moment of the explosion, he looked unmoved, calm, even ready to continue his speech. If this moment serves to show just how far those running the unconventional war against Venezuela are willing to go, it also serves to show Maduro’s determination and his strength, when looking death in the face. It was the failed Blue Coup (2015) that clearly introduced into Venezuelan politics a type of political violence in which the armed conflict plays a key role. This was when conspirators within the military began to find points of convergence, sponsors abroad, connections with the most demented elements of the Venezuelan opposition, as well as U.S. and Colombian financing for their anti-democratic agendas. Within this context, Julio Borges and Antonio Ledezma made a name for themselves as operatives of the dirty war. Since this plot to bomb Miraflores and assassinate Maduro, to date, the operative evolution, expanding abilities, and more professional methods of these forces have been noted, along with their growing presence in the country’s political life. Evidence of this was the degree of preparation of those involved in the urban war, the guarimbas (street barricades), of 2014 and 2017, along with the emergence of a local version of the Islamic State, in the case of Óscar Pérez and his co-conspirators, with a sophisticated, targeted sense of irregular violence. Their attacks on civilian and military institutions demonstrate this. A report from the Bloomberg financial report, published in the month of June, reaffirmed what has been noted since the Blue Coup: Colombia has served as the base of operations, financing and coordinating the work of coup-plotters in Venezuela. There was the so-called “Mission Constitution” was planned in Bogotá, with the backing of Colombian financiers and military men. The objective was to kidnap Maduro, and put him on trial, although the court in which this was to take place was not identified. Clearly some “Supreme Court in exile” was imagined, which could use the Colombian Congress building for the proceedings to “prosecute” Maduro. The following sequence speaks for itself: After remaining silent for several months, the self-exiled Julio Borges, who never shies away from a coup, re-emerged on social media saying that the fall of Maduro was at hand. In unison, President Juan Manuel Santos also began to warn that the end of Maduro was imminent. The economic recovery plan designed by the President and his government is a comprehensive strategy to address sensitive areas impacted by the economic war, and return the country to stability. The plan involves the re-structuring of monetary and exchange rate policy, a reorganization of gasoline subsidies, and a hard currency market to undercut influence on the country’s system of prices exerted by dollar rates established in the parallel market. In regions of eastern Colombia, political elites tied to drug trafficking and paramilitary forces, including those well established in the economic fabric of these areas, depend on ripping off Venezuelan gasoline to maintain an economic solvency that is in fact fictitious. This attack is consistent with this new scenario of escalation which began after Maduro’s May 20 reelection, when an even worse sense of insecurity was imposed on the situation in Venezuela, in which all social life is at risk. If the economic recovery plan looks to put a brake on this process, those who want to defeat the Venezuela people must disrupt it. If the sanctions and international pressure don’t work, if the population cannot be incited to oppose it, then the leader must be killed. This is the thinking that produced the assassinations of Patrice Lumumba, Omar Torrijos, and so many others. If the leader can’t be controlled, kill him. In these circumstances, killing Maduro means fracturing a society, breaking it up for good. This is what they are trying to do, and once again have failed.